These BBQ Pulled Pork Nachos are a tasty dinner or game day appetizer that only takes 15 minutes to make! Baked Nachos are always a quick and fun addition when we are menu planning and they are definitely toddler approved!! Easy Dinner Recipe? Check! Fun Party Food? Check! Easy and Fast? Check! 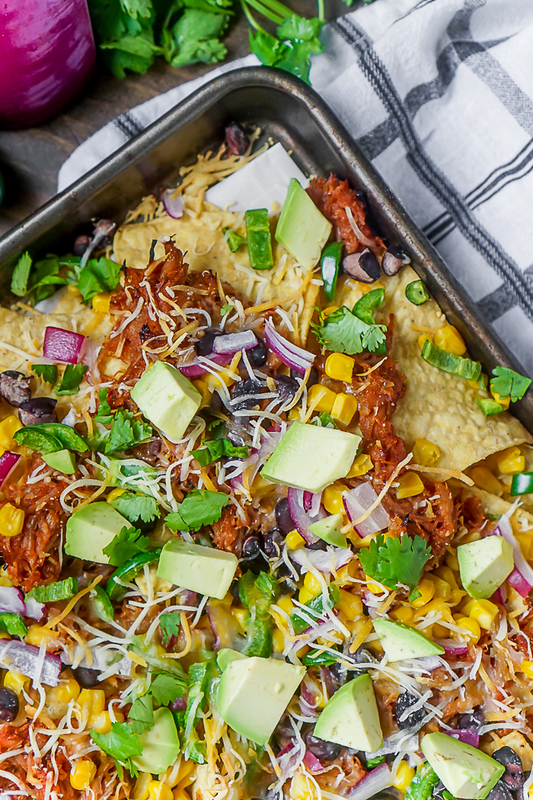 You are going to LOVE these BBQ Pulled Pork Nachos! I’m going to be honest with all of you – I am obsessed with BBQ Pulled Pork! But really, I am obsessed with fun recipes that use my 4 Ingredient Slow Cooker Pulled Pork leftovers more than I love BBQ Pulled Pork Sandwiches. We always eat it on sandwiches the first night I make a new batch, and it’s good, but my heart belongs to BBQ Pulled Pork Flatbread and these BBQ Pulled Pork Nachos. Best part – both of these recipes only take abut 15 minutes! It’s taken me a long time to share this recipe, and I don’t know why. The first time I made it up for us was for a Sunday football game because delicious game day good is the only way I get interested in football. My husband devoured them! 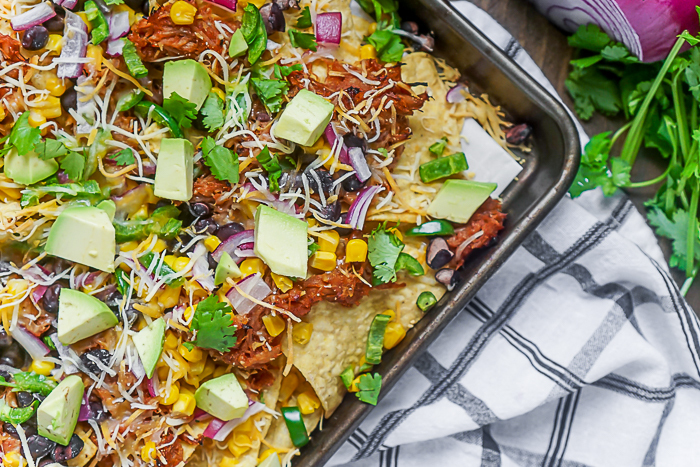 It was definitely not the last time we made these loaded pulled pork nachos. The best part about nacho recipes is you can easily serve them up for a meal or for an appetizer AND can easily customize them to your preferences or any dietary needs of your guests. For example, I will always include fresh jalapeños (no seeds) because I absolutely love the flavor of jalapeños and BBQ Pulled Pork together. So delicious! My sister will never, ever include jalapeños because she doesn’t like them. She could easily switch out for some Rotel instead if she wanted to add a subtle heat another way. If you love nachos but maybe not pulled pork, you should check out these Festive Chicken Taco Nachos! Time for Some Tasty BBQ Pulled Pork Nachos! BBQ Pulled Pork Nachos - A tasty dinner or game day appetizer that only takes 15 minutes to make! 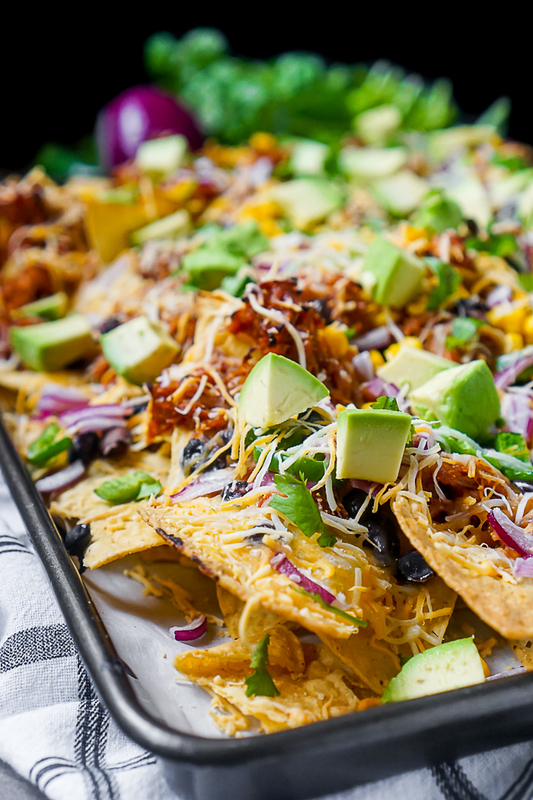 Baked Nachos are always a quick and fun addition when menu planning! Cook my 4 Ingredient Slow Cooker Pulled Pork Recipe or have other BBQ pulled pork available to use. Add BBQ pulled pork evenly over the tortilla chips, and then sprinkle onion, black beans, corn and jalapenos. Add about 2 tbsp of BBQ sauce over the top for extra flavor. Sprinkle shredded cheese on top in an even layer. Bake for about 10 minutes, or until the cheese is melted. When the nachos are done, add another drizzle of BBQ sauce if desired and then top with avocado and cilantro. Serve while warm.